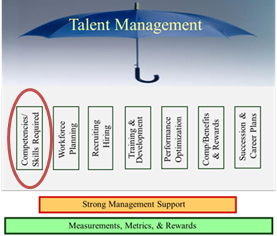 In the previous blog article on Talent Management, we defined “Talent Management” as a set of integrated organizational Human Resource processes designed to attract, develop, motivate, and retain productive and engaged employees. The initial step in the overall Talent Management process is to determine the skills and competencies a person requires to be successful in a given role. Most organizations use “skills and competencies” interchangeably and define them as: the knowledge, expertise and aptitude to do something well; the skill, knowledge and/or qualification to meet a certain minimum requirement. This discussion stops short of developing and utilizing a “Competency Model/Framework” and is beyond the scope of this blog, but contact the author if you would like additional information on Competency Models. Do you have a clear definition of success for each role or position? Do you have written job descriptions? Do your job descriptions carry through hiring, training, compensation and performance management? Do your best performers demonstrate the written skills and competencies for their role or do they do something entirely different? Does your organization have the skills and competencies to deliver your business needs now and in the future? Observe/Interview your best employees. What are they doing that puts them in that top echelon? Quantify their special abilities and skills and then link them to your roles. Many of these will become your Corporate Competencies. Further evaluate all your roles to determine the skills, knowledge and competencies required and more importantly, create measures for each area. Choose a standardized Job Description template. Create a list of all roles/positions in your organization, then group, level and compare similar roles across functions. These levels drive your compensation systems! Create your team of consulting experts, Human Resources, and a cross section of individuals in the roles to write the Job Descriptions based on your required skills, competencies and measures. Once your Standardized Job Descriptions are complete, utilize them to update the rest of your Talen Management processes. Test, validate, rewrite! Keeping these up to date often is more difficult than the original system. The process of creating job descriptions based on skills and competencies is long and complex. To ensure a successful outcome, you will likely need to involve a team of experts; consultants, Human Resources and a cross section of people in the roles being evaluated. The benefit of being able to compare roles across functions and levels and then to compare individual roles with organizational performance standards far outweighs the effort and cost. Creating Job Description based on skills and competencies is an effective method to recruit, assess, train and reward the knowledge, skills, and expertise of people in your organization. Your overall Talent Management system allows you to measure the current organization and to determine how to build the expertise needed to deliver your business needs. In future blogs, we will examine how to utilize the skills and competencies information to plan your workforce, recruit, retain and compensate key employees, anticipate training needs and link all of these into a Career and Succession planning process.